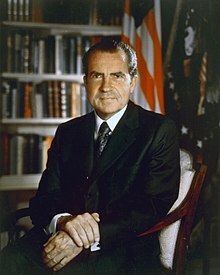 Richard Milhous Nixon (January 9, 1913 – April 22, 1994) was the 37th President of the United States. "This administration has proved that it is utterly incapable of cleaning out the corruption which has completely eroded it and reestablishing the confidence and faith of the American people in the morality and honesty of their government employees." Simple: This administration has shown that it is not able to cleanup the bad things in America, and does not have the confidence and trust of Americans in the goodness and truthfulness of people who work for their government. Simple: People need to know if their President is a bad person. I am not a bad person. I have earned everything I have. ↑ Nixon Tells Editors, 'I'm Not a Crook', WashingtonPost.com. This page was last edited on 1 February 2010, at 21:40.